Skincare is a funny thing, isn't it? You go through most of your life being blissfully ignorant and by the time you start thinking about it, it's usually because you wake up a few years shy of 30 and realize those lines are your forehead aren't going to go away. Or you have a kid and start getting hormonal acne. Or you realize you need to be taking better care of your skin in general and just moisturizer isn't going to cut it anymore. At least this combination of things is what started my skincare journey a few years ago. But let's rewind a bit. Truth is, I've never had amazing skin. I didn't have acne, but I certainly wasn't one of those (incredibly lucky) girls who made it through their teenage years without ever getting a pimple. I definitely got breakouts in high school, throughout college and into my mid-late 20s. After I had my daughter is when it started to get weird. All of a sudden I was breaking out like crazy once a month along my jawline, ranging from tiny bumps to really painful pimples underneath my skin. I paid a visit to the dermatologist and she confirmed it was hormonal acne, which is actually super common among people my age, whether you've had a child or not. She gave me two prescriptions, but I didn't want to go that route unless it was an absolute last resort. Which leads me to today's post. I didn't want to only get rid of the breakouts. I wanted my skin to look, feel and actually be healthier. I started trying new things and products and found a combination that's given me the best skin I've ever had. Seriously! At 30, I can honestly say my skin has never been better. And of course, that means I want to share it with you! That's not to say this is a one size fits all routine. What I do and the products I use might not be the right fit for you and your skin type. But in case you are interested in trying something new or are in the same boat as I was, maybe you'll find this helpful! 1. Deep clean: I use this cleanser along with my cleansing brush in the shower. I ultimately think the brush is what made all the difference when it came to clearing up the acne because you get such a deep clean. I never believed the hype about them until I started using one myself. I still want to upgrade to the Clarisonic, but the one I'm using is doing the trick for now. 2. Cleanse: I use these acne cleansing pads all over my face, along my jawline and on my neck/chest. It's a bit like a toner in that it has a nice cooling sensation and absorbs completely after about 30-45 seconds. 3. Moisturize: This is a recent addition to my nightly routine and now I don't think I can live without it! 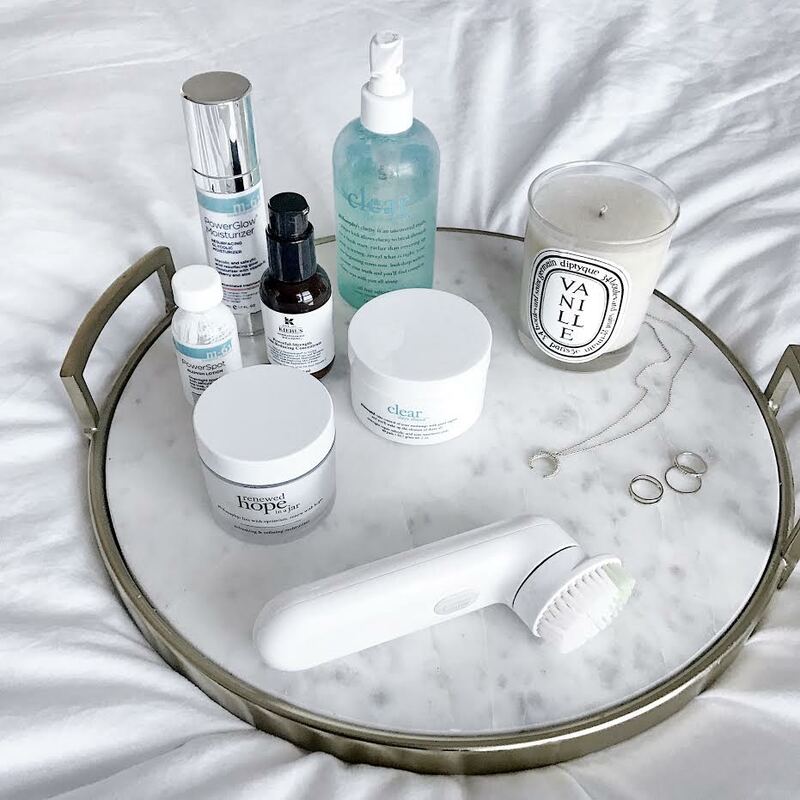 You can use it in the morning, but they recommend using it at night while you sleep because that's when your skin's restorative properties are hardest at work. A little bit goes a long way and it is pricey, but 100000% worth it. 4. Spot treat: I wish I could say my breakouts were completely gone, but that would be a lie haha. I definitely still get annoying pimples, especially around that time of the month, and swear by this spot treatment. 5. Extras: I'll use this peel a few times a week when I really want to brighten up my skin. It's amazing! 2. Treat: I started obsessing over my forehead lines about a year and a half ago and now use two different line reducers. I used this one exclusively for a while, but just added this one to my routine. I use them on alternating days before I put on my moisturizer. I've always had a wrinkly forehead, but now that I'm getting older the lines are becoming more permanent. I never really believed anything could actually help smooth them out, but this combination definitely has! 3. Moisturize: This moisturizer has been a game changer for me. I had gotten a free sample and only tried it when I ran out of what I used to use. But now I'm hooked! It's seriously made my skin so incredibly soft. A few months back, I had totally forgotten I made the switch and for a few days couldn't figure out why/how my skin had suddenly become so soft (duh lol). I will definitely be buying it once I run out! 4. Makeup: This isn't really a part of my skincare routine, per se, but I should mention that I use and love this tinted moisturizer for a few reasons. I apply it with a damp beauty blender and I love how it feels. It's lightweight, never greasy and doesn't leave my skin feeling dry. Most importantly, it has SPF in it! I've also been obsessive about protecting my skin from the sun, so this is a huge bonus. Ultimately, I feel like this works in tandem with the other things I'm doing to keep my skin looking and feeling good, which I can't say for a lot of makeup I've tried. And that's it! It might seem like a lot typed out, but this all honestly takes less than 5 minutes and has completely transformed my skin. And again, what works for me might not work for you so it's really all about trial and error. Plus, I'm always looking for new products, so this routine is ever-changing. But for now, I couldn't be happier!